Barrel racing is fast-paced rodeo event in which the horse and rider run a timed cloverleaf pattern around barrels. Barrel racing is typically performed using American Quarter Horses. 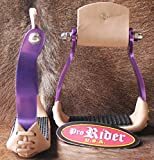 Barrel racing saddles are a type of Western saddle, and have horns. Barrel racing saddles usually have wide trees to accommodate the broad-backed Quarter Horse. They have a low-rise seat, forward hung fenders, and a deep dish cantle. This was the first brand new saddle I owned.